Home / bridal gowns / bride / japan / kyoto / news / solo wedding / wedding / wedding dress / wedding gowns / Wedding Shoot / Wedding photos package for all the single ladies! Wedding photos package for all the single ladies! All the single ladies~ All the single ladies~ Now put your hands up! It is every girls’ dream to become a princess and the best time for you to be treated or look like a princess is when you wear your beautiful wedding dress with a bouquet in your hand and a ‘prince’ at your side. But wait! What if you don’t have a prince charming? Does it mean that you can never get the chance to wear a wedding dress? Of course not! 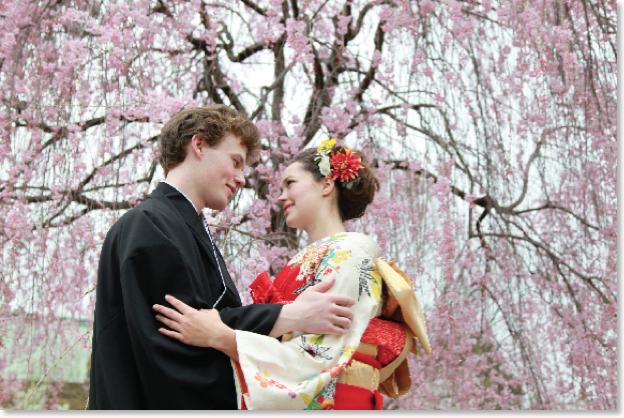 Because a travel agency in Kyoto Japan, Cerca Travel has created a two-day ‘Solo Wedding’ package for the single ladies to let them get all dolled-up in bridal style and have their pictures taken by a professional photographer. “You are single and you don't know if you would be able to get married and have a wedding ceremony in the near future, but you would like to have some pictures of yourself in a wedding gown or in a gorgeous bridal kimono, now, when you are young and beautiful..
Not only that, the package also includes a trip to the wedding dress boutique where you can personally hand-pick your own wedding gown, bouquet and hairstyle for the photoshoot. If you think you will be too lonely taking a solo wedding photos, no worries cos’ the package also allows you to choose your own handsome Japanese prince to play the role of a fake groom for your wedding shots. The pricing ranges from JPY 250,000 (RM 7,264.41) to JPY 400,000 (RM 1,1623.05). So, if you are a single lady with a lot of money to spend to be treated like a bride, head to Kyoto right away!